Not sure what’s wrong with WordPress nowadays?? I still have problems in uploading photos and pic.. – I cannot upload any fotos!!! Sometimes it is not difficult to get high visit to ur blog.. 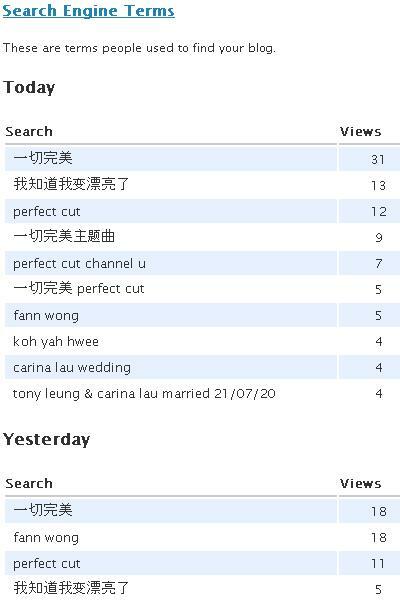 I realized… and from blog’s hits, you can observe what topic people are interested.. but of course, there are lots of other topics pple are interested.. and you dun write all topics.. But if you wrote a topic, you can check if people are keen on the same topic or are searching for the topics..
For just the MV, there were already 104 views yesterday. Above services/views are not possible without wordpress ! So when you blog, if you are amateur or expert, choose the right blog service site. If you are new to blogging, you can try out wordpress’s services… all the above said are available in wordpress..
My blog is like my diary, something I can refer or look back in future..